The San Bernardino County Sheriff’s Department is the law enforcement agency for the largest geographical county in the nation. The department serves over 2.1 million residents with 15 patrol stations and 3800 employees to ensure the quality and safety of those we serve. The department’s dispatch center takes in approximately 740,000 calls for service annually, with deputies writing approximately 98,000 reports annually. The department is augmented by several divisions to include aviation, training, patrol, dispatch, court services, detention and the coroner’s division. 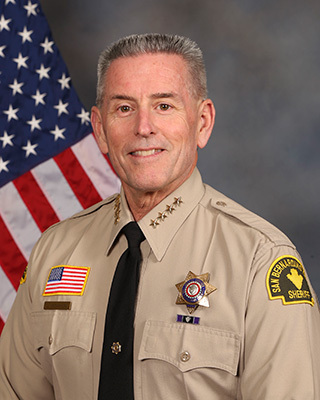 The mission of the San Bernardino County Sheriff’s Department is to provide collaborative law enforcement solutions which meet the needs of our communities and partners by delivering quality professional services to America’s largest county. The department counts on over 1800 volunteers who donate 1.5 million hours annually to help ensure the highest level of service is being given to the residents of San Bernardino County. and partners by delivering quality professional services to America's largest county. Honest and ethical behavior while giving due respect to each individual inside and outside our department. Shape the future with courage, creativity, diversity, mentoring and accountability. Collaboration with internal and external partners to become more effective in providing a better quality of life for all we serve. Provide quality service to the people who live, work and play in each of our communities. Accountability to deliver services through department members, within budget, while encouraging law enforcement innovation. As a law enforcement officer, my fundamental duty is to serve mankind; to safeguard lives and property; to protect the innocent against deception, the weak against oppression or intimidation, and the peaceful against violence or disorder; and to respect the constitutional rights of all men to liberty, equality, and justice.I will keep my private life unsullied as an example to all; maintain courageous calm in the face of danger, scorn, or ridicule; develop self-restraint; and be constantly mindful of the welfare of others. Honest in thought and deed in both my personal and official life, I will be exemplary in obeying the laws of the land and the regulations of my Department. Whatever I see or hear of a confidential nature or that is confided to me in my official capacity, will be kept ever secret unless revelation is necessary in the performance of my duty.I will never act officiously or permit personal feelings, prejudices, animosities, or friendships to influence my decisions. With no compromise for crime and with relentless prosecution of criminals, I will enforce the law courteously and appropriately without fear or favor, malice or ill will, never employing unnecessary force or violence and never accepting gratuities. I recognize the badge of my office as a symbol of public faith, and I accepted it as a public trust to be held as long as I am true to the ethics of the police service. I will constantly strive to achieve these objectives and ideals, dedicating myself before God to my chosen profession...law enforcement.